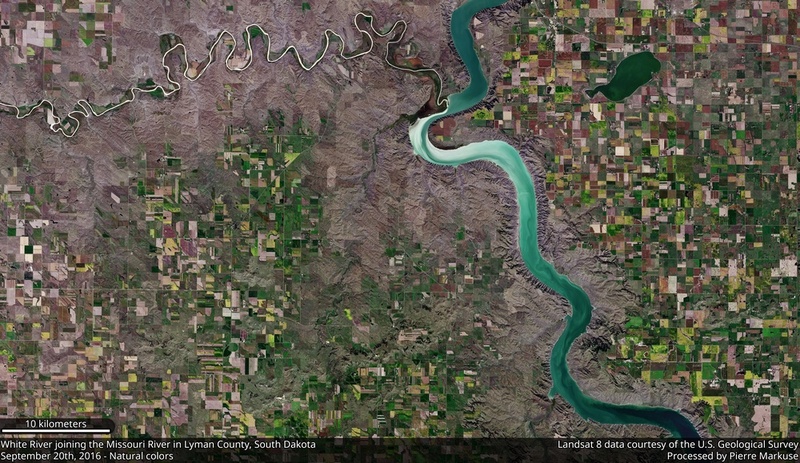 In this Landsat 8 natural color image you can see the White River (top) joining the much bigger Missouri River (right side) in Lyman County, South Dakota, USA. 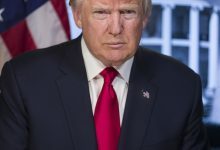 The White River is a tributary (a smaller river flowing into a bigger one) of the Missouri River with a length of a little over 900 kilometers, flowing through Nebraska and South Dakota. The water of the river takes on different colors, ranging from light-brown to grayish-white. The reason for this are the sediments the river is carrying, a mix of clays, sand, and volcanic ash. 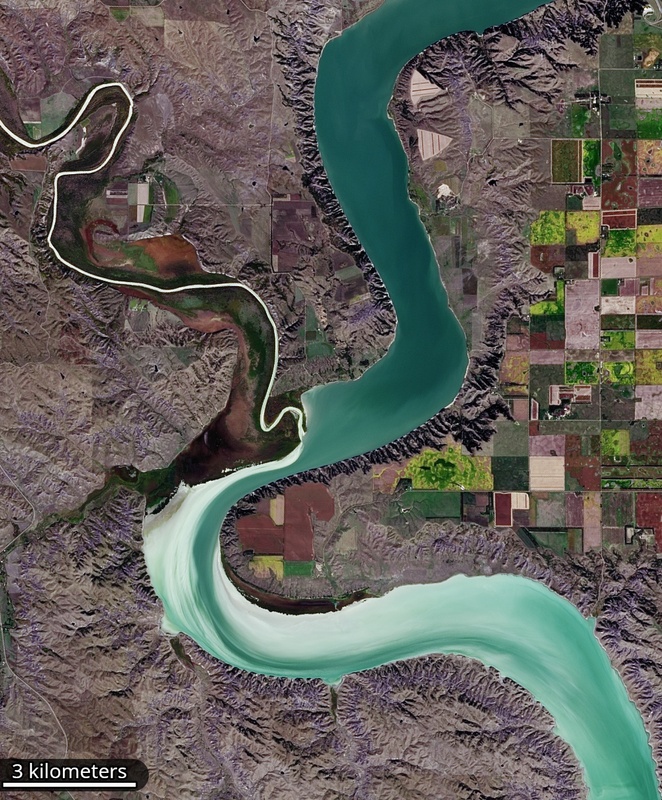 In this September 20th, 2016, image the river appears very bright, you can easily spot it, even though it is small compared to the Missouri River. Also visible in this image are agricultural fields, the Red Lake, and parts of Chamberlain at the very top of the image. In this closer look you can see the waters of the White River and the Missouri River mixing, its sediment load getting diluted by the much larger discharge of the Missouri River, which, especially from above, looks quite spectacular. Sediments in the water are also the reason for the beautiful appearance of glacial lakes. In this case the color comes from a special type of sediment called rock flour. It consists of silt-sized particles of rock, generated when the ice of glaciers is grinding over the bedrock, and reaches the lake with glacial meltwater through rivers. 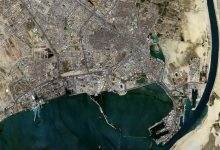 The color you get can be anywhere from milky-white to greenish-blue, depending on amount and exact size of the sediments, as well as lighting. An example for rock flour coloring a lake is Abraham Lake in Alberta, Canada. Although it is an artificial lake, the process is the same, as the lake gets its water mainly from the North Saskatchewan River, containing meltwater from the many glaciers of the Canadian Rockies. You can download a full-size version of the White River image with a scale of 15 meters/pixel, as well as an annotated and a near-infrared/short wave infrared (NIR/SWIR) version here on Flickr. 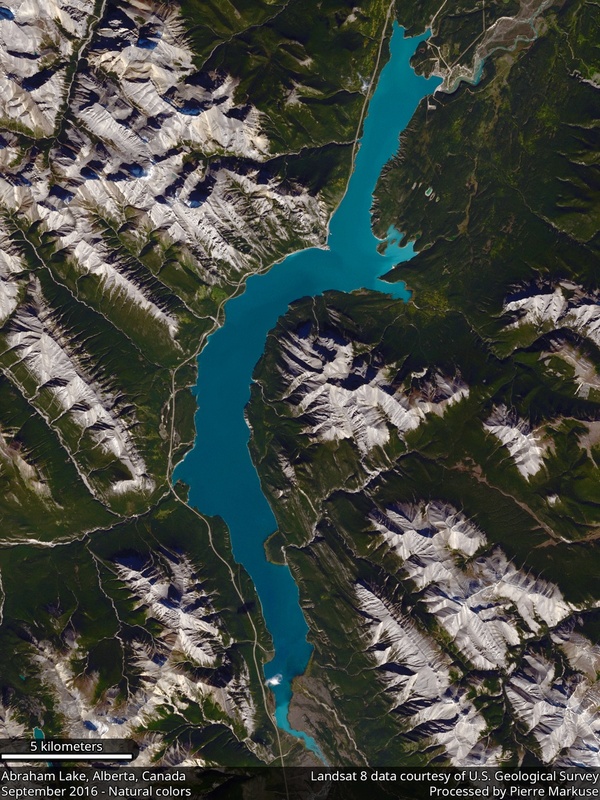 The Abraham Lake image with a scale of 15 meters/pixel is also available on Flickr.